The sharp blade slices through the skin, flesh and vascular tissues with ease. Pressure in the vascular system collapses. Almost immediately senescence – a genetically regulated process which leads to the death of cells and organs – begins. Individual cells react by discharging destructive enzymes: Polyphenoloxidase, which starts a process of enzymic browning; Lipoxygenase, which promotes oxidation of the organic tissues; Lipase, which sets into motion the process of lipolytic rancidity; and Protease, which starts to soften the texture of the flesh and skin. The metabolic properties of the organism are fundamentally disrupted: Proteins, water-soluble vitamins, antioxidants and nucleic acids, instead of being generated as they are in living things, start to degrade. At the same time, the rapidly dying appendage also starts to lose its ability to control its microbial population: bacteria, mold and fungi begin to multiply, also consuming the nutrients that had been available to the cells. Toxic and infectious bacteria start to reproduce unchecked. A macabre pre-Halloween account of a severed limb? No. I have just described what happens the moment a leaf of spinach is harvested from the host plant. And 48 – 96 hours later (depending on the temperature), half of that spinach leaf’s folates, carotenoids, vitamins and other nutrients are lost. So if your local farmer harvests the spinach on Thursday or Friday, sells it to you at the farm market on Saturday, and you eat it in your salad on Sunday, it is probably half as beneficial to you compared with the spinach leaf plucked from your roof shortly before tossing the salad on Sunday. Although not widely used, “half-life” is a concept that attempts to quantify the perishability of fruits and vegetables. Although individual nutrients, like vitamins, enzymes and proteins, degrade at different speeds, the “half-life” measure looks at all the food components generally viewed as beneficial to humans, and estimates the length of time following harvest it takes for these nutrients to be reduced to 50% of the levels present in the plant when it was alive. The notion of “half-life” ought to be a central part of the case for urban agriculture, and should inform our choices of what to grow at home. My roof-top orchard, for example, contains both peaches and apples. Looked at through the lens of “half-life,” my choice of peaches is a good one, because any peach that has travelled (or ripened off the tree) is a sorry shadow of the same fruit that is tree-ripened and twisted from the limb moments before entering your mouth. My choice of apples, on the other hand, is revealed to be an indulgence that is insupportable. I gain little from the effort to coax a few apples into being on the 35th floor, and should be supporting Hudson Valley farmers, whose apples are undiminished when they reach the markets in Manhattan and, indeed, may well be superior to their urban counterparts due to the superb terroir for apples in up-state New York. Shortest “half-life”: lettuce, spinach, kale, endive, peaches, parsley, broccoli, asparagus, sweet corn, green beans. Average “half-life”: squash, eggplant, peppers, cauliflower, apricots. Longest “half-life”: apples, winter squash, oranges, cabbage, carrots, lemons, beets. Dead or alive? One of the great joys of rooftop agriculture is the chance to eat your plants alive. Once you do, it’s hard not to look at the shiny products in the supermarket produce aisle as vegetarian road-kill. This entry was posted in Apples, Beets, Broccoli, Carrots, Cooking and Eating, Eggplant, Green Beans, Kale, Lettuce, Parsley, Peaches, Spinach, Urban Agriculture and Food Policy. Bookmark the permalink. 3 Responses to Dead or Alive? An inspired post but a bummer of a message for those of us who are farm-less….looking forward to a Thanksgiving where only the turkey is dead! This enlightening post suggests the habit of shopping daily for fresh food that I experienced when living in France has clear nutrition benefits. As a non-gardener, I will have to puzzle over how to adopt this potential lifestyle adjustment without adding gas consuming vehicle miles in my semi-rural existence. I have been worrying about the storm and your Oh! so vulnerable crops, high up and facing the river. Please send out an update soon. 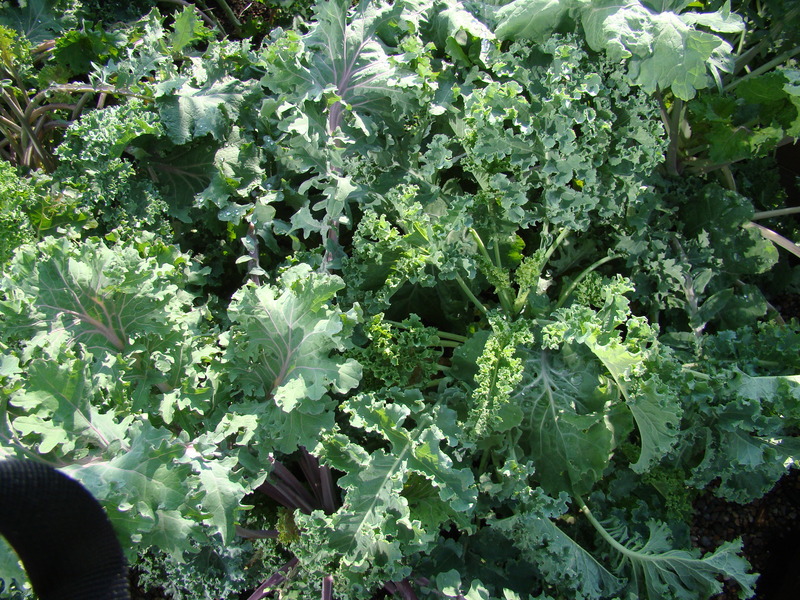 PS The kale on my rooftop in London, a mere six stories up in the air, is also doing very well this autumn.